Marc Bolan died 34 years ago today and we’re still mourning the loss of one of Britain’s finest entertainers. First and foremost, Marc was a poet, a man of words, a man of music. He remains an underrated guitarist and could stomp across a stage like none other. A fan of Tolkien, automobiles, Bob Dylan and black cats, Bolan could conjure up more magic in three chords and three words than any other wizard we know. He was a sweetheart to the lovely Gloria Jones and the father of the talented Rolan Bolan. 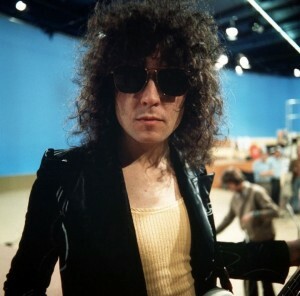 His band T-Rex will long be remembered for selling a gazillion records, creating the fan fervor T-Rextasy and near the end of his life, he even had his own television show. His influence is immeasurable, his star power mammoth and at the end of the day, he’s still our teenage dream. So today, wear a little glitter, put on your babyjane shoes and pink satin trousers and play some T-Rex. Oh, and as always ~ keep a little Marc in your heart.